For the second year in a row, MAS Charter School has earned an "A" rating on our school report card issued by the New Mexico Public Education Department! We are one of only 14% of schools in the State of New Mexico that received an "A" grade! Congratulations on the outstanding performance MAS students and MAS staff! 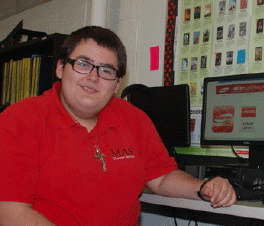 MAS Student Receives National Reading Award! Carlos faced inherent struggles as an English-language student who also had a learning disability, but his determination and positive attitude has resulted in incredible academic gains with Lexile growth of 966 points, as well as a newfound love of art and music. MAS Named Charter School of the Year! MAS Charter School was named the 2015-2016 Charter School of the Year by the New Mexico Coalition of Charter Schools!